LOCATION.--Lat 40`01'38", long 75`50'43", Chester County, Hydrologic Unit 02040205, on right bank 15 ft upstream from SR 4005, 0.2 mi upstream of mouth, 0.6 mi downstream from Chambers Lake, and 1.1 mi northwest of Wagontown. PERIOD OF RECORD.--February 1995 to current year. GAGE.--Water-stage recorder, water-quality monitor, crest-stage gage, and concrete control. Elevation of gage is 505.81 ft above North American Vertical Datum of 1988. Satellite telemetry at station. COOPERATION.--Station established and maintained by the U.S. Geological Survey. 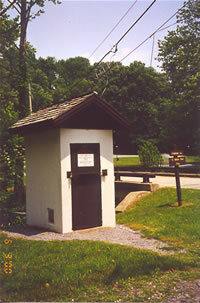 Funding for the operation of this station is provided by Chester County Water Resources Authority. REMARKS.--Flow regulated by Chambers Lake (station 01480399) 0.6 mi upstream. Satellite and landline telemetry at station. Supplied by USGS: Data transmitter operational limit - 11.6 ft, approx 9.5 ft, Lion's Head Road low point at gage.